There is something about a giant “DO NOT ENTER” sign that stirs up the curiosity in us. While some will heed the warning, for others it’s an invitation to explore what’s on the other side. Perhaps it’s due to that adventurous spirit that’s never truly left us since we were kids, despite now having to acknowledge these things called “laws” as adults. For Joe Reifer, it’s not only an enticement, but also an opportunity to capture hauntingly beautiful photographs. 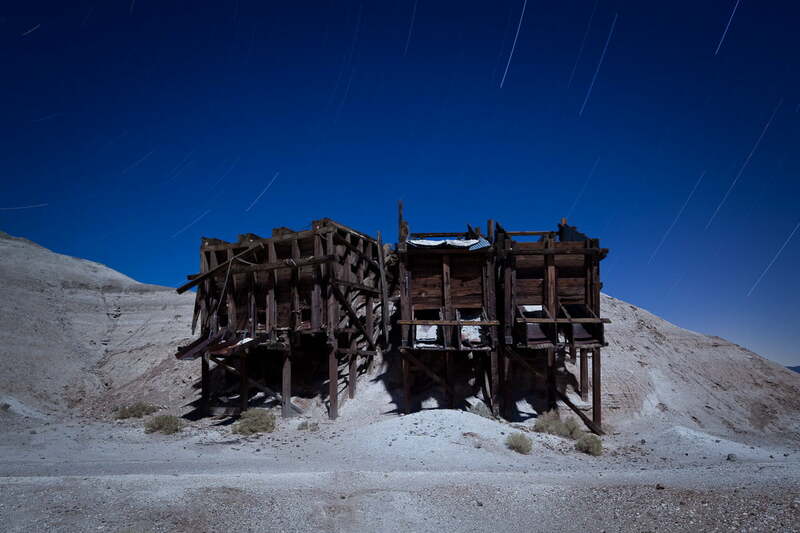 Reifer, who hails from Berkeley, California, is not only drawn to night and low-light, long-exposure photography, but abandoned places, in particular. 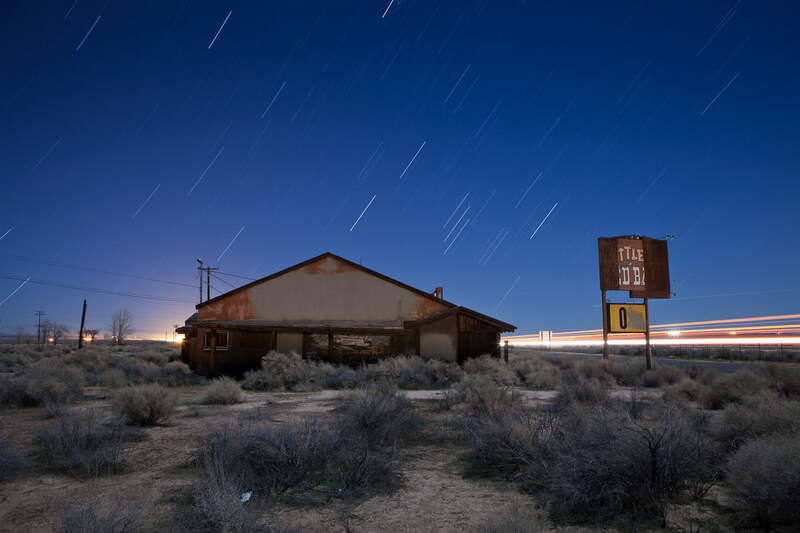 From forsaken towns that were once busy hubs of commerce to Cold War-era military bases that have shut down, it’s these settings that make Reifer’s photos intriguing. “I just happen to like ruins and old rusty stuff,” Reifer said. We spoke with Reifer about what draws him into America’s no-man’s-lands, and how he tunes his camera to capture stunning, difficult-to-master low-light photography. I’ve been interested in photography since high school, but music was my primary artistic outlet up until 1999. Around this time, my dad was doing some landscape photography workshops and invited me along. I got hooked. One thing led to another, and I ended up assisting the commercial and editorial photographer Jay Watson on a couple of shoots. Over the next five years I did all kinds of shooting, and continued to take workshops. In 2004 I did a night photography event with Tim Baskerville of The Nocturnes and have been shooting almost every full moon since. I’ve done editorial and portrait work, taught Photoshop at a local art college, and co-created a series of night photography workshops with photographer Troy Paiva. So, you’re obviously drawn to night photography. 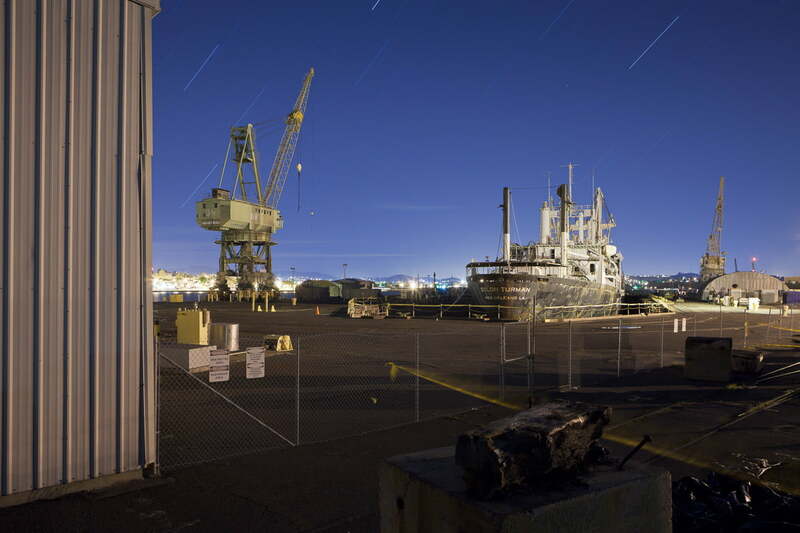 I prefer the slow, meditative pace of shooting long exposures at night. Most of my work was shot using the full moon as the primary light source. You can use more directional light when the moon is low in the sky, and softer light with the moon overhead. Clear skies are great for long star trails, and fast moving clouds can become dynamic streaks in shorter exposures. When did the abandoned places come in? I’ve always been interested in TOADs: Temporary, Obsolete, Abandoned, or Derelict sites. 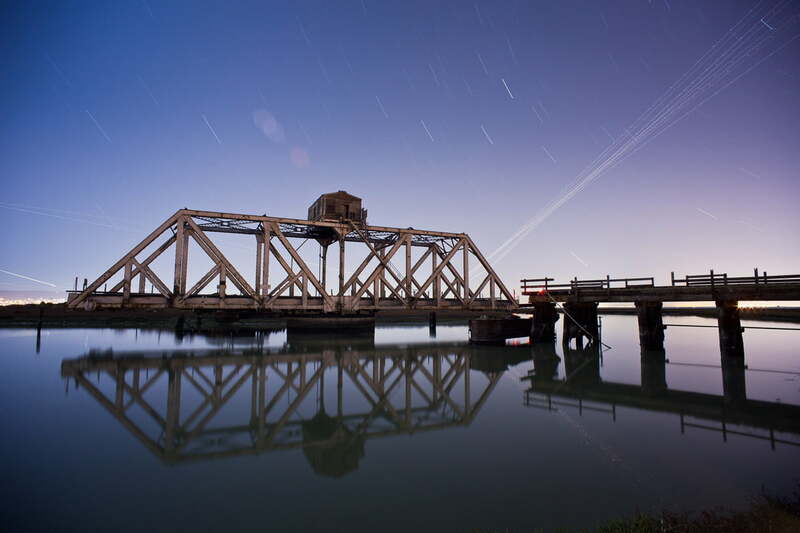 Part of the process of discovering the magic of full-moon shooting was going on adventures with photographers Troy Paiva, Riki Feldmann, and Stephen Walsh. The night photography community in the San Francisco Bay Area is a real motivator. 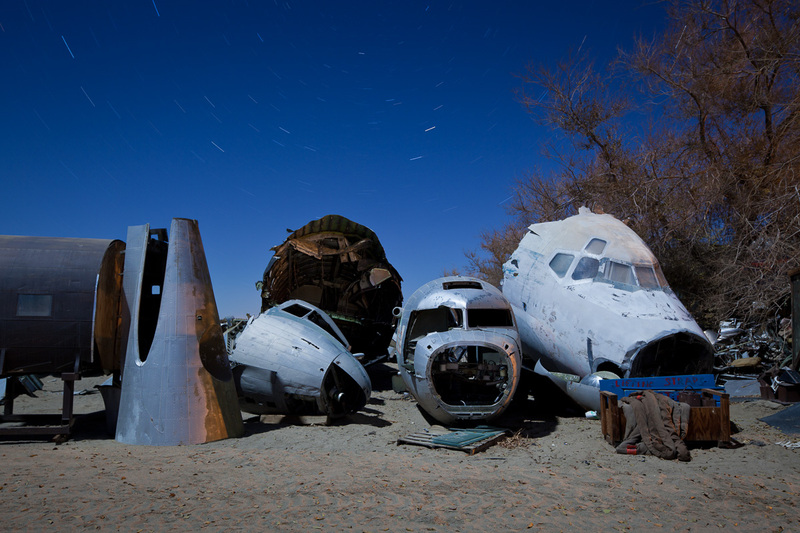 There are interesting abandoned military and industrial sites within a one-to-two-hour drive. 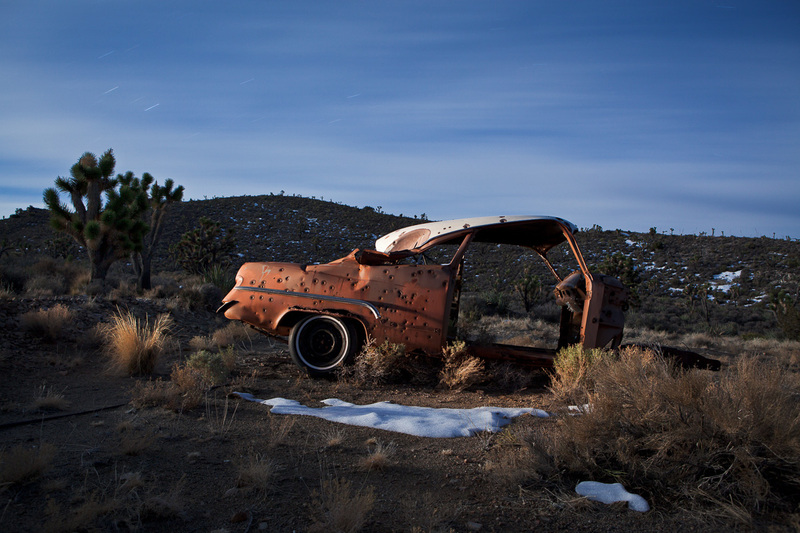 My favorite place to shoot is the Mojave Desert. There are so many amazing junkyards, ghost towns, and mining ruins; I’ve gone five-to-six times per year for the last seven years. Being physically far away from everything – at night, in front of some rusty remnants – is a really intense feeling. Hang on, aren’t these sites usually off-limits to pedestrians? Aren’t you afraid you’ll get shot at if you’re trespassing? Having permission is preferable, and always makes photography easier; if there’s security, getting permission is the way to go. I’ll show up in the afternoon with some prints, a 12-pack, and a handshake. Sometimes you’ll get turned away, and other times you’ll get the run of the place. If a location is completely abandoned, sometimes I’ll just go and photograph. Occasionally I’ll be asked to leave by security or the police. Usually I’m more worried about running into copper thieves or tweakers than getting a trespassing ticket. 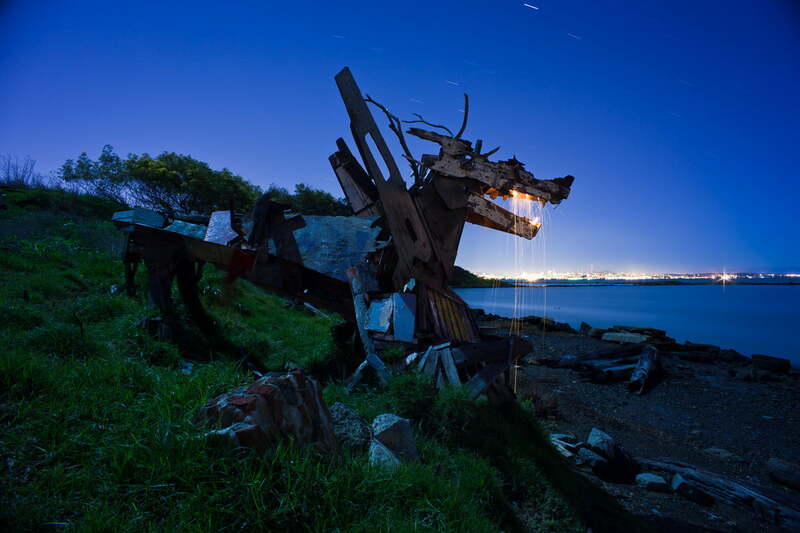 When you’re walking around these places, do you ever get scared? Do you take someone with you to watch your back? Was that gunshots in the distance? Are those headlights coming this way? A little bit of risk and uncertainty can produce enough adrenaline to get you into a heightened state of awareness. Hopefully not too heightened! I enjoy traveling with a friend or two for camaraderie on the drive, and safety in numbers. When I get to a location, I like to work alone. It’s tough to get in the zone if there’s too much socializing. Since you’re not in a photo studio, it’s obvious you need some non-traditional equipment. Night photography doesn’t require a lot of extra equipment. Just a camera, remote release, tripod, flashlights, and some warm clothes. When the moon is full, you won’t even need a flashlight to see once your eyes adjust. Flashlights are great for light painting and exploring building interiors. There’s a fine line between pushing yourself and doing something stupid. No picture is worth getting seriously hurt. I usually carry four different flashlights – a small Gerber Recon for looking into my camera bag, a regular AA Maglite for lighting subjects up close, a brighter Coast flashlight for the cooler look of an LED, and my favorite flashlight, the Streamlight Stinger, which is warm and quite bright. I wear comfortable boots, and bring plenty of layers, food, and water. I carry a few postcards from art shows, and keep a portfolio of images on my phone to show anyone I might meet what I’m doing. A GPS can be handy for remote locations where there’s no phone reception. Any extra equipment really depends on the type of location. I typically shoot outdoors, so I don’t have to worry about hazards like mold and asbestos. Indoor explorers may want to pack a ventilator. If you’re new to exploring, finding some experienced, like-minded photographers in your area is a great way to start. There’s a fine line between pushing yourself and doing something stupid. No picture is worth getting seriously hurt. What about the camera gear? How do you set it all up to take those incredible night shots? I started out street-shooting with rangefinder cameras, and also used Nikon film SLRs for landscape work. When I went digital in 2004, I switched to Canon because their DSLRs used a CMOS sensor that was capable of long night exposures. These days most DSLRs can do long exposures. For the last few years, I’ve primarily used a 5D Mark II with an Olympus 18mm lens on an adapter. The lens is small, sharp, and easy to zone focus at night. Set the lens to f/8 and the focus at 3 meters, and you’re ready to shoot. When I shoot with autofocus lenses, I calibrate the optimum focus at f/8 beforehand using live view. Then I turn off autofocus, and use gaffer’s tape on the AF switch and focus ring to make sure nothing moves. Not having to worry about focus means I can fully concentrate on the composition and lighting. For 360-degree panoramas I use an EOS 6D with the Canon 8-15mm fisheye. The lens is really sharp, handles flare well, and offers a lot of flexibility. I am a little bit of a camera bag fanatic, and have tested a lot of backpacks. I’m using the Loka from F-stop and it’s an excellent bag for hiking. I also have a Think Tank StreetWalker Hard Drive that is great if I’m traveling with a laptop. A solid tripod is a must for doing long exposure work. I use a Gitzo Series 3 carbon fiber tripod with a Markins ballhead. I have a mix of panorama equipment from Nodal Ninja and Really Right Stuff. Getting a sturdy tripod that’s not too light is really important for stability. What about settings? Clearly we can’t set the camera to auto and expect awesome night photos. Most point-and-shoots have limited long exposure capabilities, but even entry-level DSLRs work just fine for night photography. 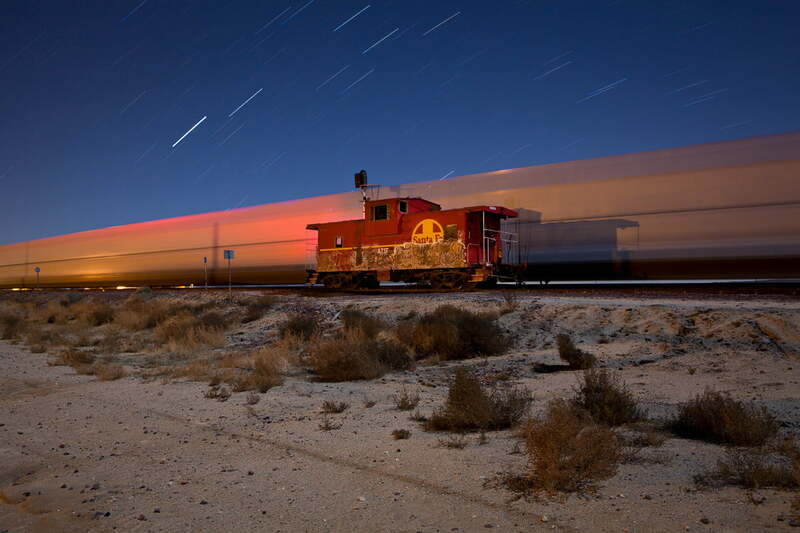 For long exposures, the camera needs to be set to Manual or Bulb. Add a remote release and a solid tripod, and you’re all set. For full-moon conditions away from city lights, an exposure of about 5 minutes at f/8, ISO 200 is a good starting place. High ISO testing on digital cameras makes calculating exposure pretty easy. The zoom lenses that come bundled can be difficult to focus at night. A wide-angle zoom that can be focused manually is a good thing to add to your kit. High ISO testing is great for checking your composition and focus before committing to a long exposure. Once you have the basics down, you can start to add light with a flashlight or strobe. When I add light, it’s usually subtle warm fill in the shadows. If the weather is “socked in” and the moon disappears, then a flashlight or flash can be used as the primary light source. Experimenting with lighting is a lot of fun. 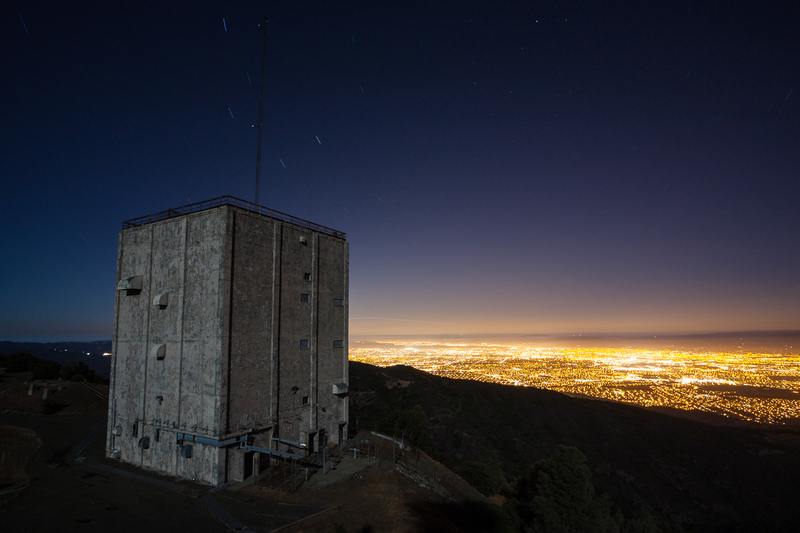 In this photo of the Almaden Air Force Station, there’s so much going on (in relation to light). How did you get this shot? Being in the right place when the moonlight was on the building, and using an elevated camera position from a nearby tower. The exposure was 8-minutes at f/9.5, ISO 50, with a color temperature of 3650K. When I originally processed the image in 2007, I used a second exposure of 2 minutes (two stops darker) to bring back detail in the city lights. I just went back and re-processed the original file in Adobe Lightroom and it looks fantastic without this extra step. It’s amazing how far raw processing has come in the last few years. The stars will move with any exposure over 20-30 seconds. The length of the star trails depends on the exposure time, and the direction that the camera is facing. Once you get to know the night sky, it becomes an important compositional element. Do you think you’ll get bored one day? Are there things that still excite you with each trip you make? I haven’t been bored yet! Some photographers shoot the same type of subject for their entire lives, and others cycle through projects every few years. The simple question I ask myself is, “Am I having fun?” Your passion for the subject matter comes through in the photos. So many of my peak experiences over the last 10 years involve night photography. I feel like I’ll always love being out under the full moon. That being said, I’m slowing down a bit on the desert trips, and working on some other photo projects right now. I enjoy shooting with toy cameras and pinholes, and I’m planning to do a series of panorama portraits. What’s at the top of your gadget wishlist right now? I’d like to get the Canon 24mm f/3.5 TS-E II lens again for shooting architecture. This lens is useful for keeping buildings straight, controlling depth-of-field, and shooting stitched panoramas. It’s also extremely sharp!